Once again, Barça have kept their side of the bargain. All they can do is keep winning to keep up the pressure on Liga title rivalsReal Madrid, and they did that comfortably on Sunday night with a solid 4-1 victory at UD Las Palmas. Neymar Jr was the man of the moment with a splendid hat-trick as Luis Enrique’s makeshift back four did a fine job at the other end. As if Barça’s defensive crisis wasn’t bad enough, with Sergi Roberto suspended and Gerard Piqué sick, Javier Mascherano was also forced to withdraw at the last minute after feeling discomfort during the warm-up. That meant a Liga debut for Brazilian Marlon Santos in the centre of the FCB defence, with Lucas Digne filling in at right back. The first half was a scrappy affair, and although Barça sometimes struggled to produce football of their finest vintage, they kept things steady and two moments of brilliance made all the difference. After 25 minutes, a cheeky back-heel from Sergio Busquets was followed by a pinpoint through-ball from Andrés Iniesta, and rather than shoot Luis Suárez chose to lay up a simple tap-in for Neymar Jr. Clinical football and Barça were finally in charge. Within a flash, the Catalans had doubled the lead. Neymar repaid Suárez for his earlier unselfishness by supplying the latter with an impeccable cross, and following a deft Uruguayan flick, Las Palmas keeper Javi Varas had been beaten for the second time in two minutes. The first 45 minutes produced very little from the home side, who are playing merely for pride at this stage of the season. But following the break they found new verve, and after a number of minor chances were rewarded when centre back Pedro Bigas finished a rapid counter-attack by making it 2-1. Nervy moments for Barça? Not in the slightest. Within moments they were two goals in front again. Ivan Rakitic whipped in a cross from the right and Neymar Jr headed home. 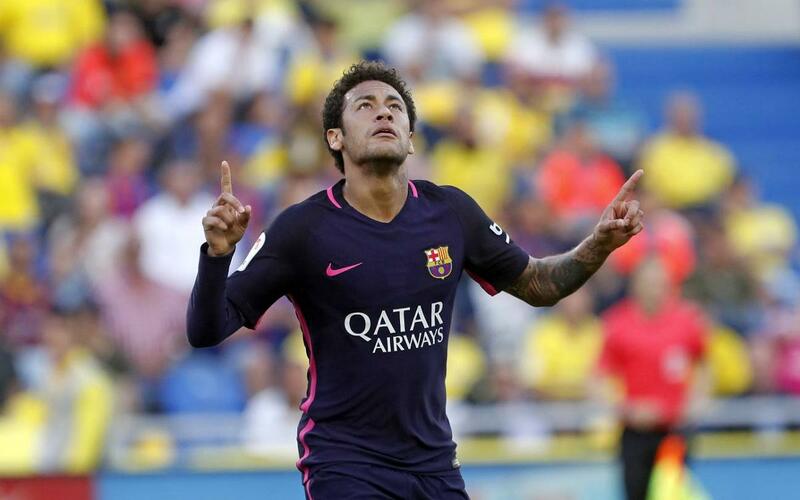 And the ball had barely started rolling again before Neymar was celebrating his third hat-trick in a Barça shirt. Jordi Alba was the provider this time and the Brazilian stroked home from the narrowest of angles. There may still be a late twist in this Liga tale. Let’s hope so! Força Barça!